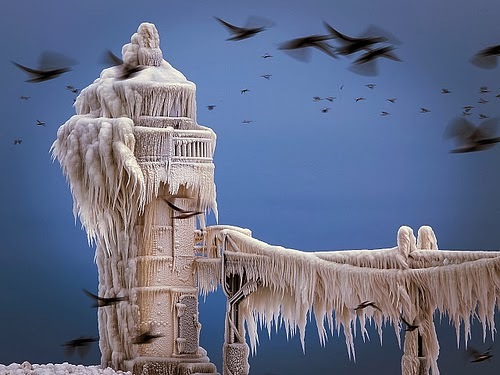 Julie Gard: "There'll be no landing at the lighthouse tomorrow"
"There'll be no landing at the lighthouse tomorrow"
Here's a bit of winter magic for February 2, just when I thought winter magic had all run out. Never again will I doubt the serious and whimsical strangeness of the north - how ice clings to ice in impossible shapes of known things, in a spell that only the birds can undo but choose not to. Not yet.